THE TDI DECOMPRESSION PROCEDURES MANUAL IS THE TEXT-BOOK LITERARY ASSISTANT TO THE TDI DECOMPRESSION PROCEDURES CERTIFICATION COURSE. TDI has brought this course to the recreational diver in response to the demand and desire for more information. - Recreational divers can take the course to develop new skills and understanding. - Recreational/Technical divers can take the course during the series of courses available through TDI, usually between Advanced Nitrox and Extended Range and Trimix. 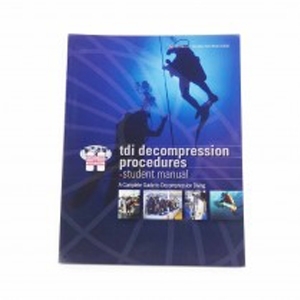 The TDI Decompression Procedures course prepares you for planned staged decompression diving. With a maximum operating depth of 45m/150 feet, this course is your first step beyond the normal sport diving limits. The TDI Decompressions Procedures course combined with the TDI Advanced Nitrox course form the foundation of all other technical courses. Both these courses also have the academic versions available online…get started today! Using the Decompression Procedures Manual as a reference, students may utilize the Knowledge Quest Work Booklet by answering the provided questions with the most appropriate and accurate answers.